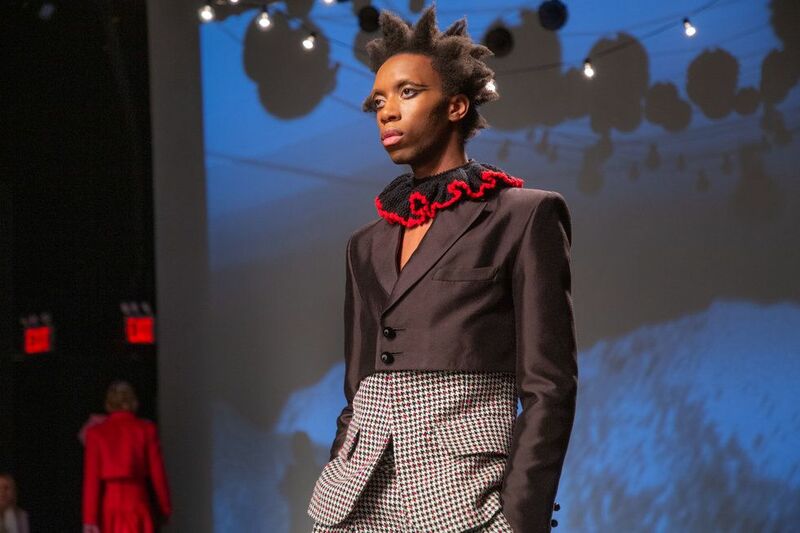 Palomo Spain aptly named its fall 2019 menswear collection "1916." 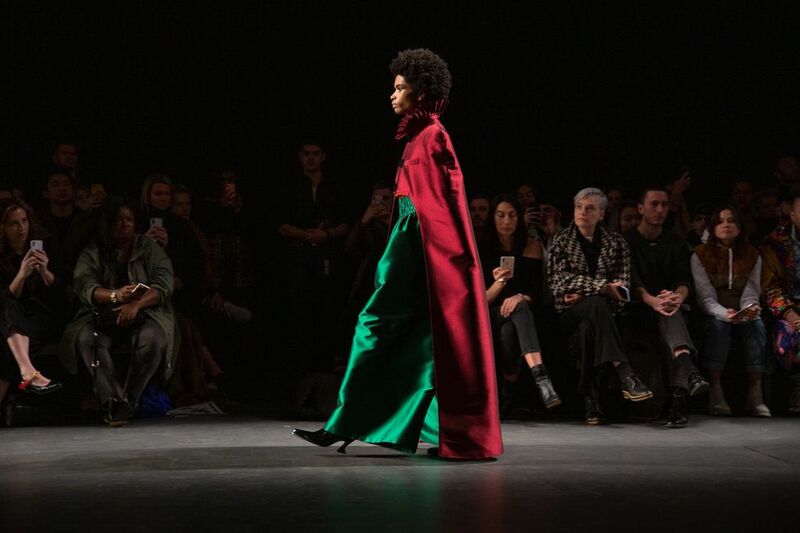 This wasn't the first time the label had shown in New York, but the collection marked a return for designer Alejandro Gómez Palomo since he last showed here for fall 2017. 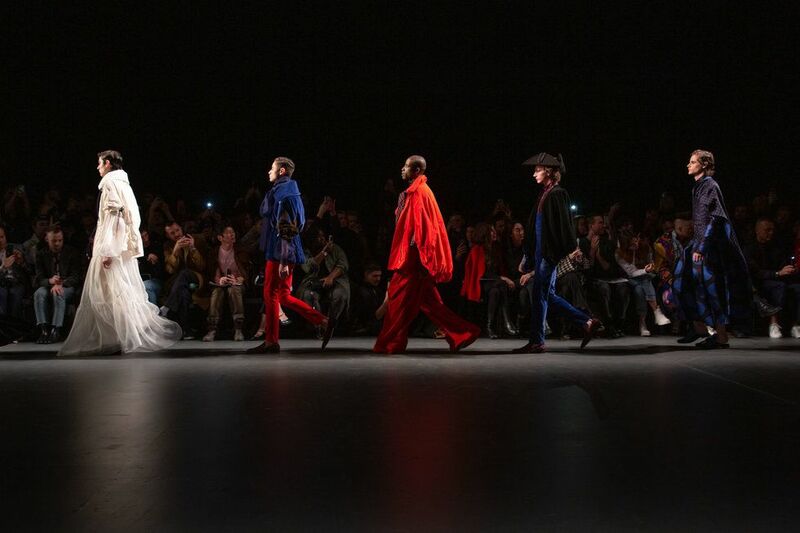 "Unconventional, avant-garde ballet," is how Palomo described this season's aesthetic backstage after the show. "There's a lot of black which is new for me, and tailoring which is a completely new take on what I've been doing, until now." For 1916, Palomo Spain printed its own zine in Spanish for the audience, with bits and pieces describing the historical references in the collection. 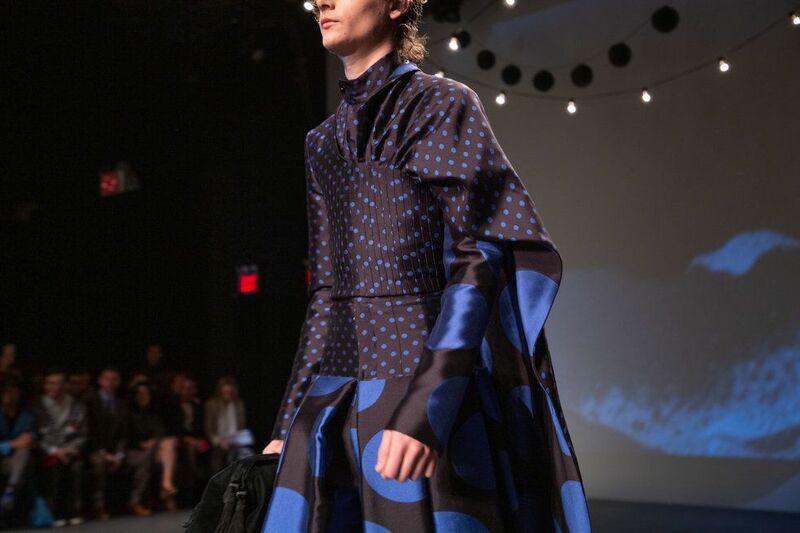 On Palomo's approach this season, the designer told PAPER: "Before, it was from womenswear trying to make it menswear, now, we started with very strong sense of tailoring, taking it to my own universe which is more sensual and feminine." Here's everything else you need to know. Look 23: an explosion of color on the runway. A deep red cape with a ruff-inspired collar (a Victorian article of clothing worn by men and women, which ruffled around the neck) was worn over a pair of high waisted emerald-hued pants and purple opera gloves. An orange turtleneck peeked out from under the cape. The most memorable accessories? 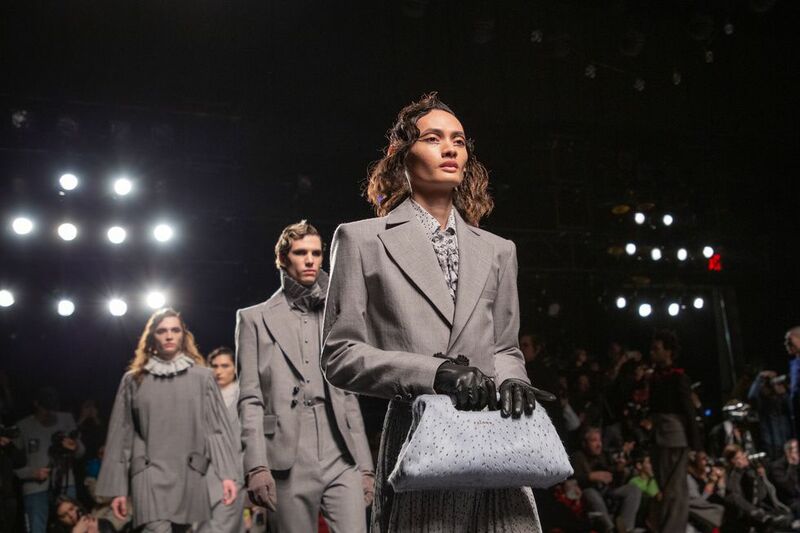 It's a toss up between the oversized bags in sumptuous leather, the dramatic opera gloves or the playful pirate hats a few models wore down the runway. According to Palomo backstage, this was the first time the designer used nylon in a collection. "It's my take on sportswear in my universe," he said. Velvet, embroidered tulle, silk and jewel-toned silks also had a presence. Palomo Spain cast a diverse group of cool kids, notably including photographer Jacob Bixenman (who shot Teddy Geiger for PAPER), broadway breakout Isaac Cole Powell, next gen model meets activist Richie Shazam, and Internet sensation Parker Kit Hill. The show also introduced an array of new faces, from Serena Tea to Matthew Later. 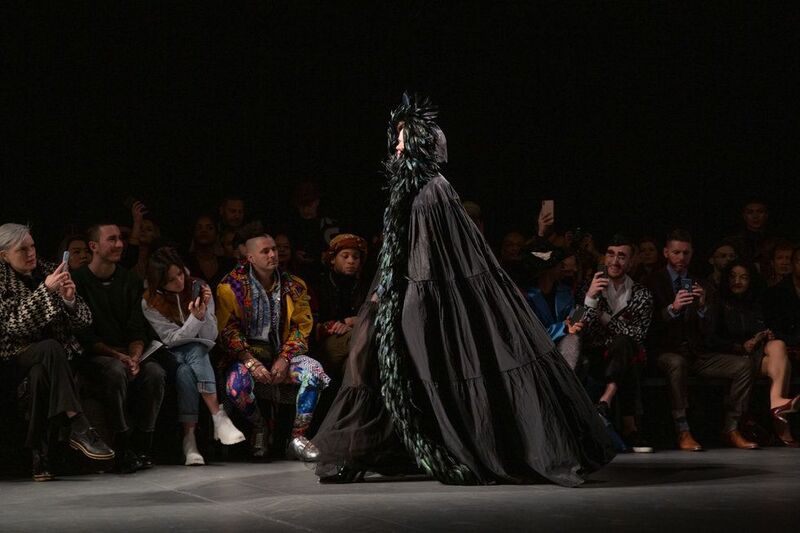 The designer was inspired by Ballet Russes and its influence in Spain — and all the unconventional twists and contrasts in-between. The MAC Cosmetics makeup team painted tiny black polka dots (which mirrored patterned fabrics throughout the collection) on some of the models' faces.